Are you tired of the liver spots on your skin? Many people who have liver spots on their skin normally face the challenge of getting rid of liver spots effectively. Removing liver spots from the skin is very easy all you need is the right lotion to do that. Before you start treating liver spots it is best if you understand what it really is and how it occurs. Liver spots are sometime called age spots or sun spots. They are brown lesions that appear on the skin due to over exposure to the sun’s rays. They are usually dark brown in color however this depends on the complexion of the skin. Our skin contains melanin which helps to prevent our skin against ultra violet rays of the sun. When we expose our skin to more of the suns radiation, then the skin we produce more of the melanin. This will lead to excess melanin being produced resulting to some being deposited on the skin inform of patches. The patches will form on parts that are more frequently exposed to the sun like arms, face and shoulders. Liver spots are not a skin infection that should cause panic, it is harmless in that it is not cancerous nor does it require medical attention. Nevertheless it is recommended for you to see a dermatologist just to make sure that it is really liver spots. There are many forms of treatment for liver spots; some of the methods like laser treatment, freezing and use of acids are very expensive. You don’t necessarily need these methods since, apart from being expensive they are painful and most often results in scarring on the skin. 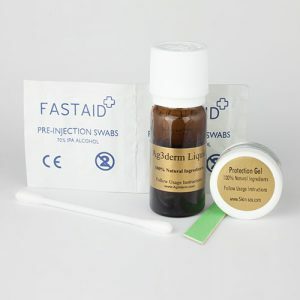 The best treatment for liver spots is use of lotions. The skin lightening lotions are very helpful when it comes to removing the lesions since they contain chemicals which are very effective. The lotions have been medically proven to help treat age spots without causing any side effects. It is also recommended that you apply the skin care lotions every time you want to go out in the sun. This is because the skin care lotions can also prevent you skin from being damaged by the ultraviolet light. Lastly, make sure the next time you go shopping for skin care products, the skin care products you buy should contain sunscreen protection. Also make it a habit to shop from recognized stores so that you don’t end up with counterfeit skin care products.